Beetroot has to be one of my favourite root vegetables. I love all the different colours you can get and a recent addition to my veg box was a bunch of golden beetroot. At first I thought about boiling it and mixing it with white wine vinegar and some spices. Then I got to thinking about proper comfort food and a golden beetroot remoulade would be the perfect finishing touch to a rather traditional dinner. A fantastically earthy alternative to using celeriac. Squeeze any excess moisture from the beetroot. Luckily with golden beetroot there are no purple stains to clean off of your hands and the rest of the kitchen when you’re done! In a bowl mix together the mayonnaise, yoghurt, mustard, lemon juice, parsley and seasoning. Stir everything together well and then add the grated beetroot. It is important to use a good quality mayonnaise for this for two reasons: firstly, it’s the base of the remoulade so you want it to taste excellent and secondly, you want it to be good and thick otherwise your finished remoulade might be a bit runny. No one wants runny remoulade. 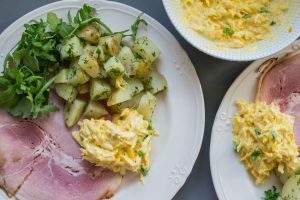 I served my remoulade with some steamed new potatoes which had been covered in butter and fresh herbs, a little rocket salad and some delicious honey roast ham from the local butcher. A little update, or my version of, something that I know my grandparents would enjoy immensely. Simple flavours with a little pepperiness from the rocket, punch from the mustard, sweetness from the beetroot and freshness from the herbs. I can also confirm that beetroot remoulade makes a fantastic addition to a cheese sandwich; preferably one with very strong, crumbly cheddar. 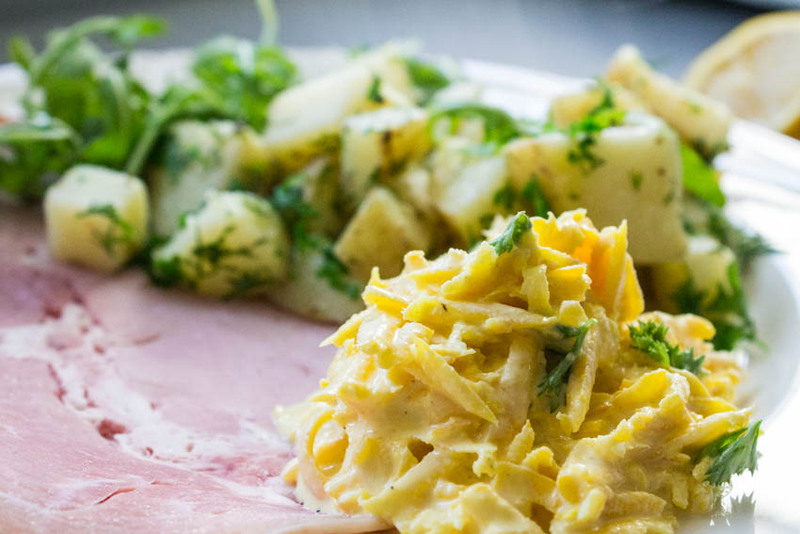 I love remoulade but usually do it with celeriac, great idea with golden beetroot! We adore remoulade, even the plain one tastes GREAT. Love the idea of using this gorgeous winter root veggie in it. We enjoy remoulade made with celeriac and I really like your idea of using golden beets as a substitute. What a great idea to use the golden beets instead of celeriac! How fun and healthy! They are delicious, you could use half celeriac, half beetroot if you wanted! This looks really good and it is something I have never tried yet! This is a win-win recipe for us over here, as we love beets and remoulades. I think this will go well with some nice fried fish. It would be great with some smoked fish especially. I’ve never grated a beet – can’t believe it’s never occurred to me! What a nice idea this is, Caroline! If the red beet didn’t stain everything it touches, I’d be tempted to make a multi-color remounted! Thanks for the idea! It does stain a little but if you wear gloves you could definitely give it a try! They are fantastic raw, the purple ones will leak out more colour than the yellow ones so use gloves if you’re using purple beetroot! that’s a meal full of great flavors and textures! this is one way i might actually be able to enjoy beets!